It is not just the disease agent in the vaccine, the growth mediums, and adjuvants we are talking about, but rather all of the other ingredients like formaldehyde, polysorbate 80, Gutaraldehyde, 2-phenoxethanol, thimerosal, beta-propiolactone, phenol, neomycin, and streptomycin, to name a few. These ingredients are toxic in themselves let alone in combination with the disease agent and immune system modulators found in vaccines: Fail. The vaccine industry relies on a continuous supply of host tissue cell cultures such human aborted fetal cells, monkey kidney or pigs intestine cells. Human fetal cells come from abortions, 100,000’s of monkeys have donated their kidneys to the science of vaccines and I am not sure where they get the pigs intestines from. Could it be a by-product of the meat production industry where the pigs are stuffed full of antibiotics and growth hormones before they are slaughtered? Fail. The economic outlook on the public health care campaign of vaccines is grim if you take the whole picture into account. On the one side, the global vaccines industry was valued at $24 billion in 2009 and is expected to reach $52 billion in 2016 at a Compounded Annual Growth Rate (CAGR) of 11.5%. On the other side, the annual cost of autism has more than tripled to $126 billion in the US. The cost of providing care for each person with autism through his or her lifespan is $2.3 million: Is this an economically sustainable health care model? Fail. While one could argue that infectious disease incidence has dropped with the use of vaccines, we are seeing an alarming rate of other conditions arising in our children: In the United States an estimated 1 in 50 children are diagnosed with autism: In 2005, 8.9% of children in the United States had asthma.Now an average of one out of every 10 school-aged children has asthma.,  In 2007, 29% of children who had a food allergy also had asthma: Vaccines have failed to contribute beneficially to the long-term health of our children or the environment. Fail. On the other hand let us examine Homeoprophylaxis. Homeoprophylaxis (HP) is the use of potentized substances given by oral ingestion prior to exposure to disease with the aim to prevent that disease. Nosodes are used in the process of prophylaxis. Nosodes as defined by the Food and Drug Administration’s Homeopathic Pharmacopoeia of the United States are homeopathic ‘attenuations‘ of pathological organs and/or tissues, causative agents, or disease products from infected individuals, such as discharges, excretions, and secretions. With the creation of nosodes, through the attenuation process of potentization, the energetic frequency of an infectious agent has been captured while removing its virulence and toxic effect. Nosodes are prepared without any preservatives, adjuvants, and toxins. Non-toxic: As homeopathic remedies are prepared by dilution in pure alcohol there is no longer any source material present. The final solution is anointed onto sugar pellets and the alcohol evaporates. There are no preservatives, host tissue cells, or immuno-modulators present: Pass. The cost of Homeoprophylaxis is a minimal initial outlay of money: $277 per child. HP provides a safe effective form of educating the immune system with no long-term health consequences. The model of HP is economically sustainable. Pass. Children who undergo HP programs are found to be healthier then children who have not received any protection, and children who have been vaccinated according to Dr. Isaac Golden’s 15 years of research into HP. HP benefits the health of the individual who in turns contributes to a healthy society. Pass. Golden, Isaac, PhD, DHom, ND. “Homoeoprophylaxis – A Fifteen Year Clinical Study A Statistical Review of the Efficacy and Safety of Long-Term Homoeoprophylaxis.” Aurum Pty Ltd. Melborne. 2004. 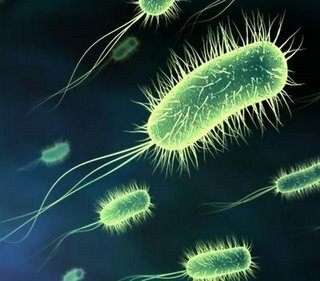 Anti-microbial resistance, bacterial and viral infections and homeopathy’s potential to help address a growing crisis. At a side event of the 66th WHA entitled ‘Antibiotic Resistance – a threat to Global HealthSecurity and a Case for Action’ 12 countries outlined their strategies to address the problem, strategies that essentially involve: severely reducing antibiotic use in humans and animals, preventing drug-resistant microbial infections and researching new pharmaceutical products. In the face of the global crisis of antimicrobial resistance, far more attention now needs to be paid to how medicinal systems such as homeopathy and herbal medicine can play a significant contributing role in combating the crisis and protecting the power of antibiotics for when then are truly needed. More centrally funded research is now needed to show how homeopathy can effectively play a role in the future prevention and treatment of infectious illness thereby helping prevent antimicrobial resistance and preserving antibiotic effectiveness. Brydak LB, Denys A (1999). The evaluation of humoral response and the clinical evaluation of a risk-group patients’state of health after administration of the homeopathic preparation Gripp-Heel during the influenza epidemic season1993/94. International Review of Allergology and Clinical Immunology; 5:223–227. Aabel S (2001). Prophylactic and acute treatment with the homeopathic medicine Betula 30c for birch pollen allergy: a double-blind, randomized, placebo-controlled study of consistency of VAS responses. British Homeopathic Journal; 90:73–78. Aabel S, Laerum E, Dølvik S, Djupesland P (2000). 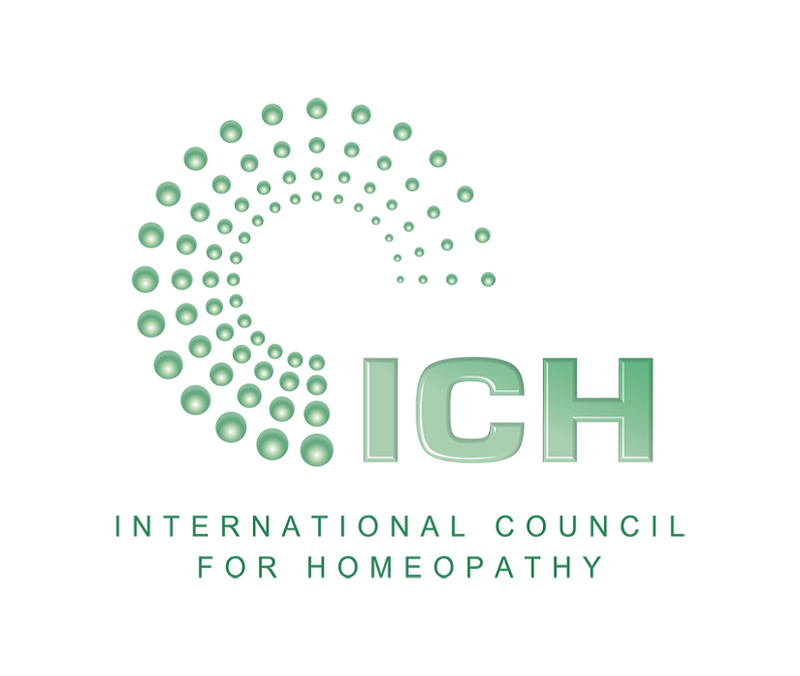 Is homeopathic ‘immunotherapy’ effective? A double-blind, placebo-controlled trial with the isopathic remedy Betula 30c for patients with birch pollen allergy. British Homeopathic Journal; 89:161–168. Wiesenauer M, Lüdtke R (1995). The treatment of pollinosis with Galphimia glauca D4 – a randomized placebocontrolled double-blind clinical trial. Phytomedicine; 2: 3–6. Jacobs J, Jiminez LM, Gloyds SS, Casares FE, Gaitan MP, Crothers D (1993). Homoeopathic treatment of acute childhood diarrhoea. 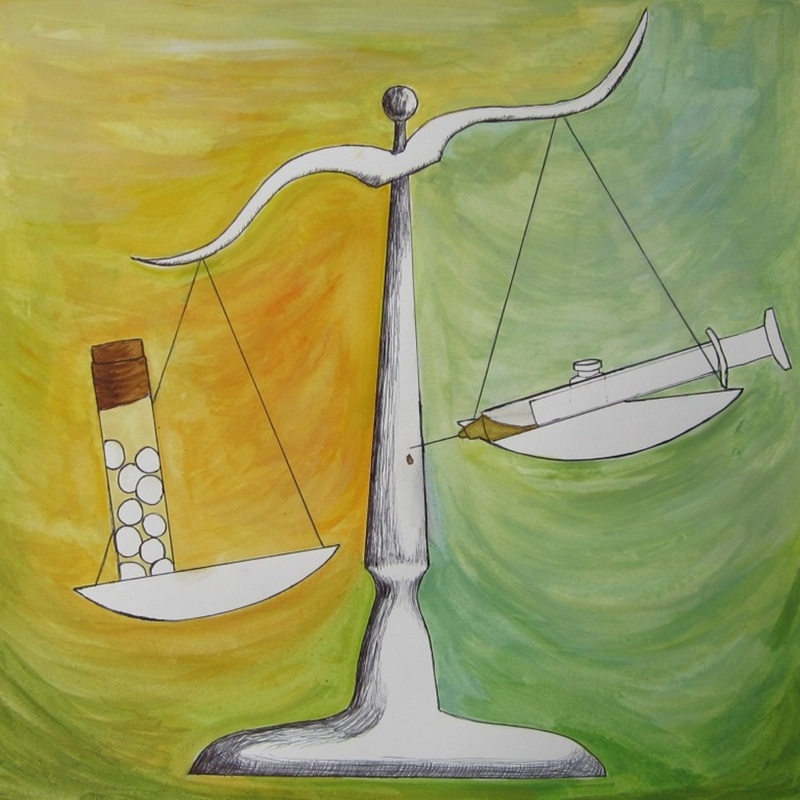 A randomized clinical trial in Nicaragua. British Homoeopathic Journal; 82:83–86. Gassinger CA, Wünstel G, Netter P (1981). Klinische Prüfung zum Nachweis der therapeutischen Wirksamkeit des homöopathischen Arzneimittels Eupatorium perfoliatum D2 (Wasserhanf composite) bei der Diagnose “Grippaler Infekt”. [A controlled clinical trial for testing the efficacy of the homeopathic drug Eupatorium perfoliatum D2 in the treatment of common cold]. Arzneimittel Forschung; 31:732–736. Friese K-H, Zabalotnyi DI (2007). Homöopathie bei akuter Rhinosinusitis. Eine doppelblinde, placebokontrollierte Studie belegt die Wirksamkeit und Verträglichkeit eines homöopathischen Kombinations-arzneimittels [Homeopathy in acute rhinosinusitis. A double-blind, placebo controlled study shows the efficiency and tolerability of a homeopathic combination remedy]. HNO; 55:271–277. de Lange de Klerk ESM, Blommers J, Kuik DJ, Bezemer PD, Feenstra L (1994). Effects of homoeopathic medicines on daily burden of symptoms in children with recurrent upper respiratory tract infections. British Medical Journal; 309:1329–1332. 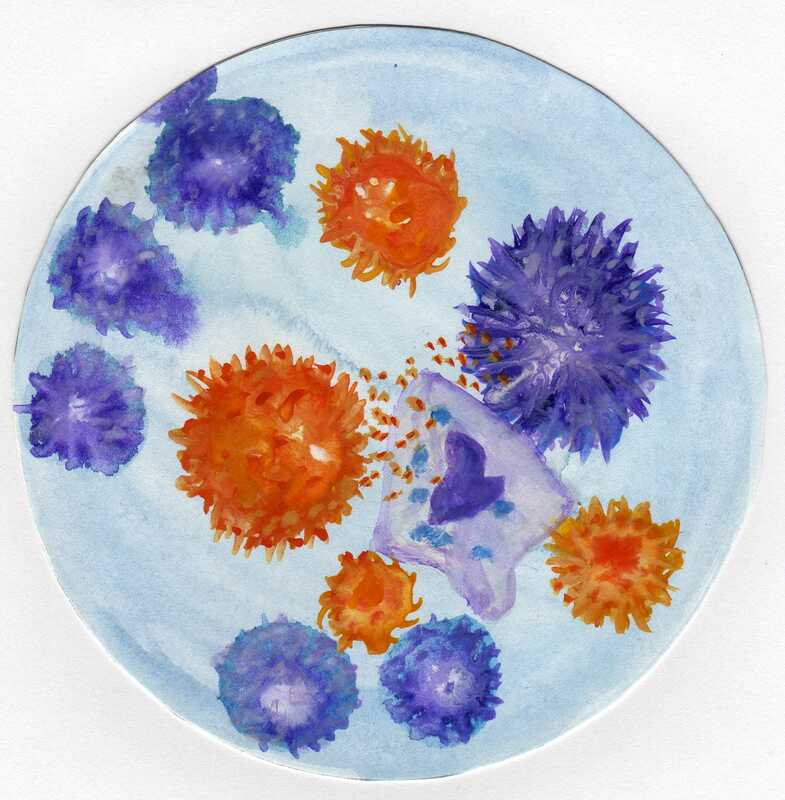 The cycle of inflammation: T cells (orange) communicate via cytokines with other inflammatory cells, such as B cells and macrophages, to maintain and amplify this cycle. Before answering we must determine the reasoning for the question. On one side there is fear of sickness; on the other there is now fear of vaccines and adverse events. It is from these points of view this question is being raised. We have been led by conventional medicine to view febrile sickness as a worrisome thing to avoid at all costs. 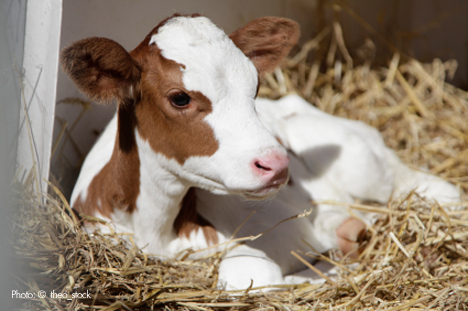 The use of vaccines and antibiotics has been towards this end. On the other side, as the number of vaccines have increased and doctors over prescribe antibiotics, parents are seeing their children suffer more severe immunological distress than the sicknesses may have ever caused. The immune system’s primary function is to discern self from non-self. Who am I and who am I not? This function is mirrored by the act of putting food in our bodies (what needs to be absorbed and what is eliminated? ), the billions of antigens we encounter daily (do I need to make antibodies against or not? ), and the process of intellectual discrimination (what thoughts are rational and what is junk? : What do I know is true and what have I been led to believe?). We are exposed to all sorts of external influences. The immune system’s function is to discriminate: A healthy immune system knows how to react with the environment and how to build a defense to those agents which could otherwise harm it. The strength of our defense mechanism determines the extent of our reaction. Those who are sickly will produce an insufficient immunological response and the process of disease can progress. Those who have a strong defense mechanism are at risk for over reacting, producing too high of a fever or purgative process which also puts the body at risk. Healthy immunological response is to produce a sufficient fever and the appropriate elimination pathway resulting in immunity. Fevers and discharges are healthy and are necessary for normal childhood development. If a child never gets fevers they are at risk for chronic disease later in life. 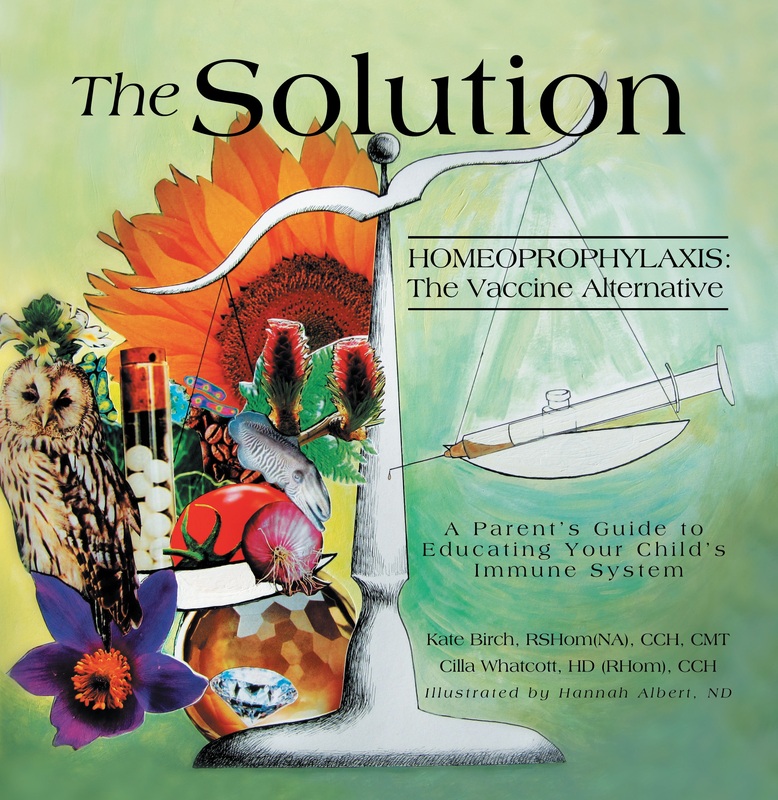 The problem of not vaccinating, and not having a method to treat infectious disease is that when your child gets sick, unless you have access to homeopathy to treat the illness, there is risk of harm. With vaccinating however, rather than the risk of infectious disease, the child is at risk of vaccine injury which can have life-long devastating effects. The opening question is best translated to: how is homeoprophylaxis affecting the immune system and is there a risk of homeoprophylaxis injury? The nosodes used in homeoprophylaxis are sourced from pure disease entities without added adjuvants, preservatives, and incubation medium. They are potentized (serial dilution) beyond the point of having anything in them. These nosodes still maintain an energetic imprint of the disease which has the ability to initiate an immunological response when administered orally. The desired response is to produce mild symptoms relating to the disease of the nosode given (fever and discharge). The purpose is to practice immunological action to that disease entity so that if exposed, the immune system knows how to respond appropriately. If the immunological response to the nosode is significant enough it will generate immunity to the disease. Typically the immunological response is mild and short lived (24 hours or less) while the body behaves ‘as if’ it has the disease. As there is no disease agent present, the symptoms subside on their own. Is this sickness? Not really. It is healthy immune system function which helps to build a healthy immune system. In contrast to vaccines where the immunological response stimulated can lead to high fevers, seizures, allergic reactions, ear infections, neurological problems, developmental delays and more, homeoprophylaxis can never cause this. Vaccines are made with the actual antigen, multiple disease are given at once, and vaccine adjuvants force an over productive immunological response. 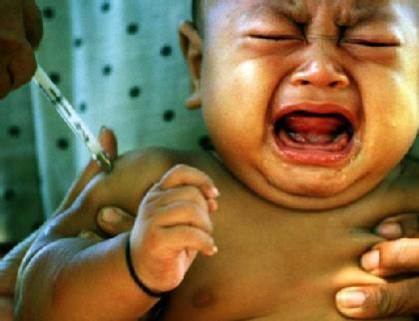 As vaccines are injected they need to be eliminated. It is the attempted elimination process which puts the child at risk. Rather than helping to build the immune system, vaccines act to confuse immunological response, leaving in their wake a generation of children lumbering with allergies, pervasive developmental delays and neurological deficits. They have done nothing to teach the immune system how to discriminate as it should. The mom of my 11:00am new patient appointment with a 9 year old autistic girl with excessive violence problems called to reschedule as the she believes the child has PANDAS: They wanted to address the PANDAS with Antibiotics. I explained that homeopathy can help with not only the autism but also the PANDAS. More often than not the PANDAS are a result of too many antibiotics given for ear infections that are a direct result of the vaccines. In my mind I am not sure how more antibiotics are going to help. 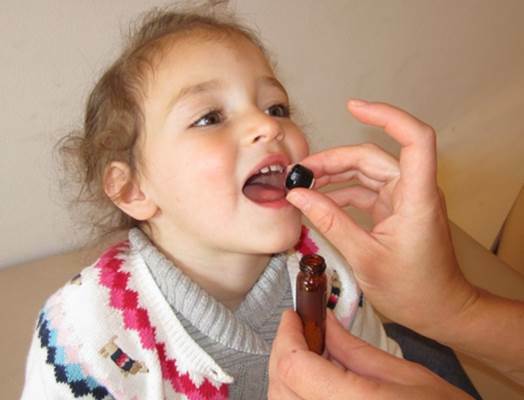 A mother called about her two and a half year old son who had been having a fever on and off for the last three days: This mother was new to homeopathy when her daughter got a full body skin rash from her first DTaP vaccine. After Clearing the DTaP vaccine with the CEASE protocol in homeopathy the skin rash completely resolved. We had also been working on clearing the Pediarix vaccine from her son. He had behavioral issues, was not talking, and seemed to be having a variety of symptoms that looked like developmental delays. With every vaccine he had been given she was instructed to give Tylenol so that he wouldn’t get a fever. I had explained that in order for the vaccine to do what it is intended to do, ie to stimulate immunity, the child needed to get a fever. The reason her child was suffering from the developmental delays was that because the fevers had always been suppressed. In these last two months with the CEASE clearing of the Pediarix vaccine he had been developing fevers and discharges and now his behavior is normalizing. He is speaking more and development seems to be returning to normal. This fever today was a random fever not relating to any clearing protocol. She said this is the first natural fever he has had she has not given Tylenol for. Based on the symptoms I suggested Gelsemium and to call back in a few hours. My expectation was that he should sleep, the fever would go up, and he would sweat. When he wakes the fever should be gone. I got a call from a long-time patient whose neighbor got a flu shot three weeks ago and is now in the hospital with Guillain–Barré Syndrome: The symptoms started shortly after the vaccine with weakness and paralysis of lower limbs but progressed quickly to full body paralysis with an emergency tracheotomy as he was suffocating. During the surgery they accidentally cut his vocal cords so now he can’t speak. She wondered if homeopathy could help? I said yes we would need to address why his immune system is attacking his nerves. Later, while registering a new family for the HP program for their second child I had a long discussion with the mom about how to talk with the nurse mother-in law about not vaccinating: This mom had initially come to me for help with their three year old who, after the Pediarix vaccine started to develop OCD type behaviors after the second round of antibiotics given to address the recurrent double ear infections she had been having. The mother was remarking that since we had initiated the CEASE Clearing protocol with the Pedirax vaccine nosode and Carcinosin, and after the fevers and sweat which developed in the clearing process, her child had stopped screaming and throwing tantrums, had begun to talk, and toilet train and no longer screamed in the bath. It was after these improvements and a new understanding of how her child’s immune system had been struggling with the vaccines that she and her husband decided that they did not want to vaccinate their new born. During our conversation as I was explaining that HP nosodes are just the pure disease energy without any other ingredients like bovine casein, pig’s intestines or human diploid cells (aborted fetal tissue), she stopped me and said she started to feel really sick. I asked why? She said it was because her brother-in-law, who developed the Hib vaccine, was over just recently getting more cows blood from their dairy cows for his vaccine lab; She was becoming sick at the realization of her small little part in the production of vaccines that in turn were being injected into millions of children who in turn could end up with developmental delays and more. She was sick to her stomach at the implication of it all- this mad-scientist method of disease prevention we have indoctrinated everyone into believing is truth. This week I have had the opportunity to step outside of my country of residence (USA) for a week, and with much rest have had the time to examine the state of affairs in the US with regards to vaccines, autism, and states encroaching on parent’s rights to rais e their children the way they see fit. In my sojourn I have traveled to England where a band of people have dedicated their lives to defaming homeopaths. They stand by their assertions that all homeopaths are delusional and there is no way homeopathy could ever help to prevent or treat infectious contagious disease amidst a growing measles epidemic. I have read blogs discussing how vaccines have killed, maimed, or otherwise damaged the health of children, and other blogs on how people are fired from their jobs, or kicked out of schools for not vaccinating. There are posts from mothers who have lost the ability to know in their own gut what is right for their children; who are easily persuaded by fear and propaganda while the government is busy making plans to track everyone’s vaccine status. All this is happening in a country where infectious disease is nearly nonexistent. The whole thing seems way out of control. The reason and rationale that should prevail in ordinary, thinking people’s minds is shot out the door. Pregnant pro-vaccine moms are pitted against life-long friends who are parents of non-vaccinated children. We must first try to understand the true nature of infectious disease. Next we must understand how the immune system really works, and then seek to find a system of medicine that helps the individual learn about the disease process and how to recover from it. People may come and go, but no matter what we do, infectious disease is here to stay. It is our job to figure out how to live with these viruses and bacteria in harmony. If we let the government tell us what to inject into our blood, have we lost the sovereignty over our own bodies? Then is it really possible for us to think for ourselves anymore? Let’s calm down bit, let ration be our guide, and look towards a Solution that can help get us out of this mess. Children can grow up free, happy and healthy without risk of adverse events that results in death, allergies, seizures, etc.